If you are currently or have been a parent of a small child, you have probably spent more than a few hours fretting over how much time your children spend with the television, smartphone, or tablet. Despite the periodic splash of what may seem like counterintuitive advice, it seems that many children still tend toward an unhealthy amount of screen time. Screen time is, of course, only one consideration when you think about how your kids spend their time, but it highlights one broad category of the discussion over a child’s activities: where kids are spending time. It is this discussion about place that opens the door for Dr. Scott’s How To Raise a Wild Child. Scott D. Sampson, resident paleontologist at Dinosaur Train HQ, has thrown his safari hat into the ring of advocates for returning kids to nature. 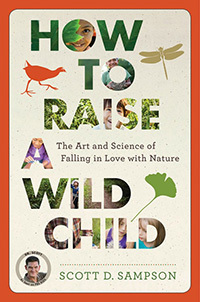 To be accurate, Sampson has been writing and advocating for a renewed perspective on nature for years, but How To Raise a Wild Child brings attention specifically to where kids are spending their time and the effects of place on a child, in terms of emotion, intellect, and physical capability. The general argument that Sampson makes is convincing in its simplicity, and the benefits promised to parents willing to get their children outdoors are attractive. This most obvious argument—nature stimulates the imagination—is just a start; Sampson proceeds through the book with evidence of improved emotional health and motor skills among groups of children who spend considerable time outdoors. Sampson’s writing, for the sake of readability, comes off as anecdotal, while roughly thirty pages of notes and bibliography are tucked away at the back of the book for more inquiring readers. Each chapter ends with a handful of what you might call “thoughts for the road”—key points waxed more heavily earlier in the chapter—along with a “Secret for Raising a Wild Child.” These secrets can vary in application and value, depending on how deep into nature you and your family already are, or how willing you are to change your schedule. The fundamental concepts, though, are certainly given their real-world application, so the book proves both to be a philosophical argument and a bit of a handbook for the parents who are rookie naturalists. Depending on your position before reading How To Raise a Wild Child, the book might feel a bit like “preaching to the choir.” It’s true that you’re probably more likely to pick this book up if you’re already committed and/or attracted to the idea of getting your kids into nature—it is definitely what drew me to the book (along with the superb jacket design). So maybe you don’t need to read a book that confirms what you already know and believe. Whether you’re already going to the local parks, have a backyard garden, or even get out to the deeper wild on a regular basis, there are some nuggets to be found in Sampson’s monologues. One such nugget I discovered is that nature is both big and small, and we don’t need to put ourselves in “big nature” in order to reap the benefits that go along with immersion into the wild. This sentiment might carry more weight if you live in a city, though it’s a valuable reminder for all. City imagery generally does not mesh with what we think of as “nature”, but if you remember that all of the urban trappings that make up our modern cities are simply ornaments placed on top of a wilderness that goes down miles toward the Earth’s core, it’s easy to realize how small elements of the wild still live right alongside us in our cities. The personal experiences Sampson shares in How To Raise a Wild Child help to round out the book and illustrate his arguments well. Granted, if your dad is a paleontologist, you’re getting a bit of a head start in connecting with nature (“easy for you to say...”, you might think). But it’s his roles as parent and naturalist that make Dr. Scott the authority and valuable resource that he proves to be. I picked up How To Raise a Wild Child with a pre-existing love for nature and a six-year-old child at home who shares that love. Despite our family’s existing awareness, I closed this book with renewed appreciation for my immediate world outside (it’s an urban one), and I also picked up some useful practices I hope to try with my own child. She’s pretty wild already, but after spending a few hours with Dr. Scott, I’m convinced she can do with a bit more wilding.